The next day, we are out and up into the valley, wandering over the site. We have only just arrived when a man turns up. News travels fast somehow. Every body seems to know exactly what we are doing and where we are all the time. 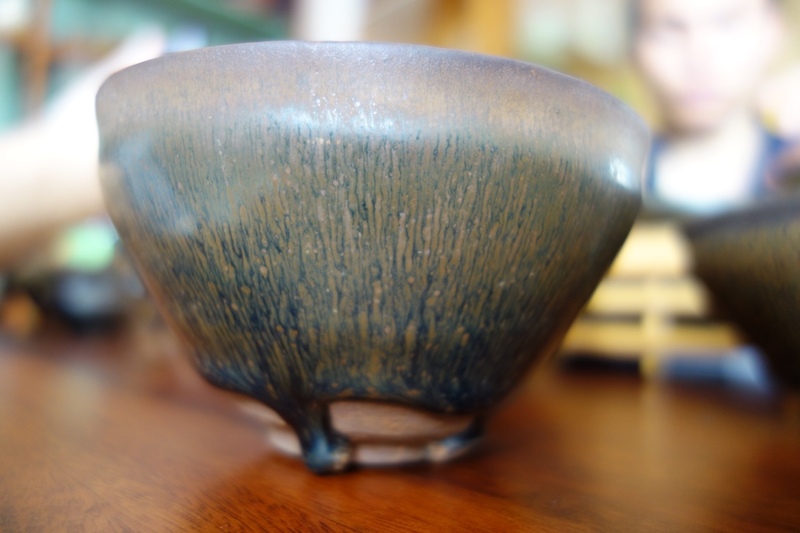 We sit down at a street stall to grab a meal of noodles and bowels and the guy doing the cooking turns around and pulls out his phone and brings up a photo of a beautiful tenmoku bowl! He knows who we are and why we are here. He nods and smiles and flips through several images. We say thank you, and give him the thumbs up. Smiles all round. So I’m not too surprised that this guy knows about us. We are the only people on the site in the rain again today. He waves and shouts at us. He is obviously telling us some thing important. We wander down the slope to meet him. He holds out his arms, held high in front of him in a very obvious and determined way. He seems to be telling us to stop whatever we are doing and come down off the site. We meet up with him and he makes a sign that he will hand-cuff us! This is getting serious. Leo says that he thinks that he might be a policeman. I respond that Chinese policemen don’t wear fake US army ‘cams’ jump suits with USA paratrooper air-corps logos and thongs on their feet! He motions us to follow him and we go back to his house in the village at the edge of the site. 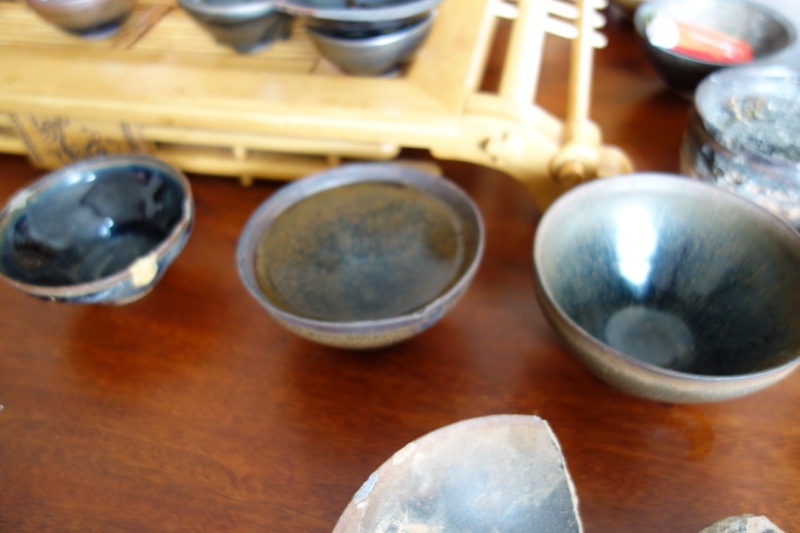 We are now sat down at a very finely crafted wooden table set with tea wares and loads of tenmoku bowls and their fragments and shards. We are now all friendly and tea is made and served. He proceeds to show us his collection of shards and almost complete shards. We ooh! and arrh! appropriately and ask if we can take photos. After our umpteenth cup of tea, I begin learn that if you drink the tea, he is obliged to refill the cup. So the only way to end the ritual is the not drink the tea and leave the cup full. My bladder will burst if I have one more cupful! This strategy seems to work and I’m spared any more tea for the time being. It slowly becomes apparent that this Dude doesn’t want us taking anything off the site, because it’s ‘his’ territory. He seems to think that he has scavenging rights and he doesn’t want any foreigners side-stepping him. Maybe he wants us to buy our shards from him! I could be wrong, but this is the strong impression that I get. I can’t be sure, because we have no way of communicating with each other, except by charades. 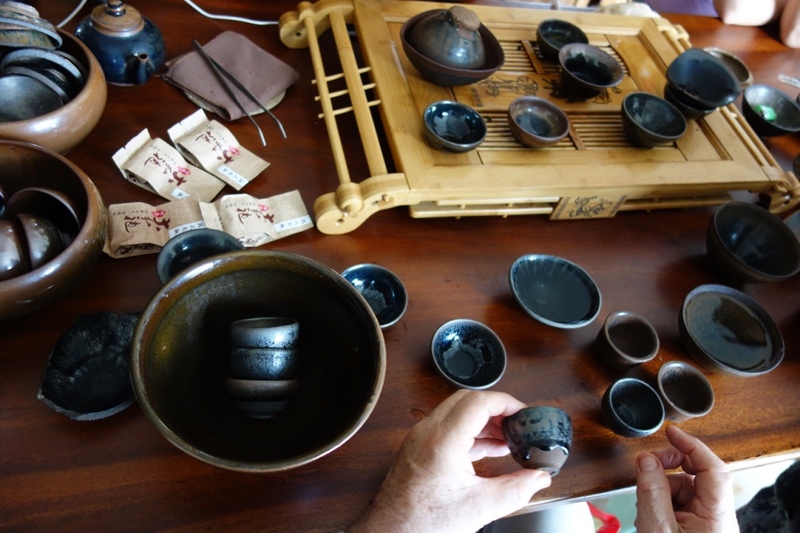 My colleague thinks that it will help matters along if he gets out his lap top and shows this guy that he has been in the US, going to all the great collections of tenmoku bowls. Working with the curators and examining all the tenmokus in their collections, and photographing them all for his research. 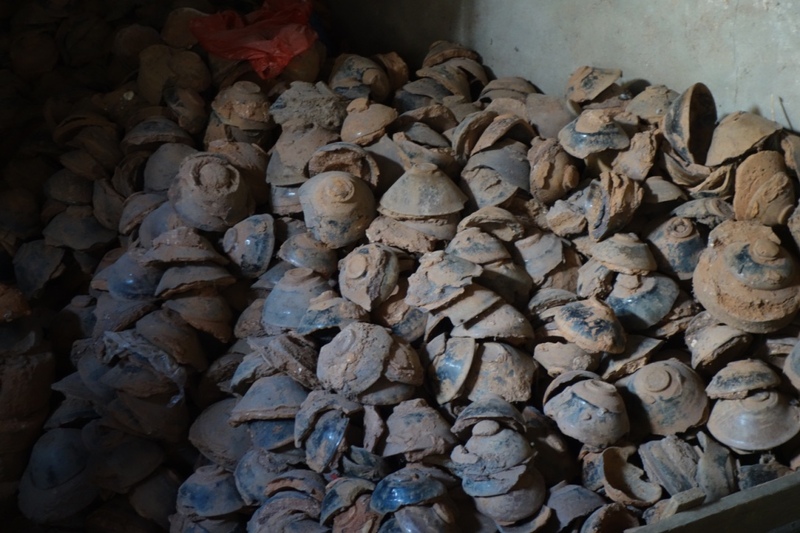 Building up a data base of all the great pots and recording the various surfaces that have been made here over the 4 centuries that this valley was productive. He has an amazing knowledge of the subject now and is fast becoming the world expert on Southern tenmoku. 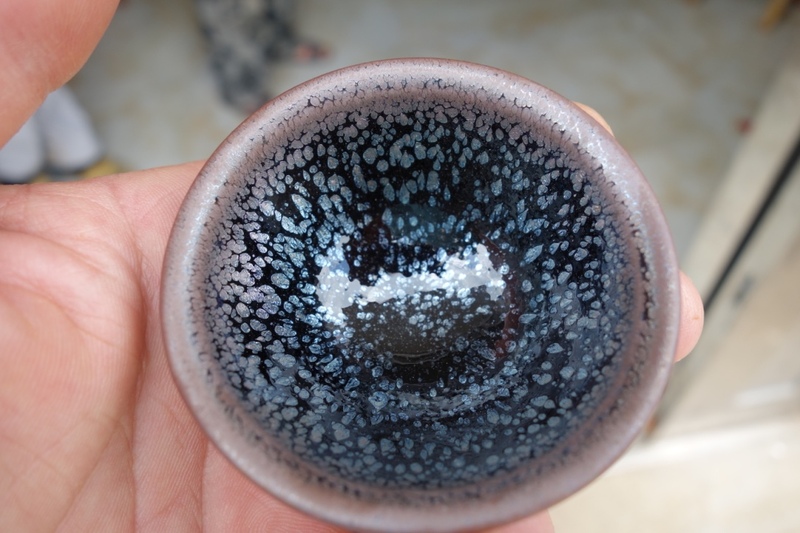 His slide collection of all the great bowls is extensive and exquisite in detail. 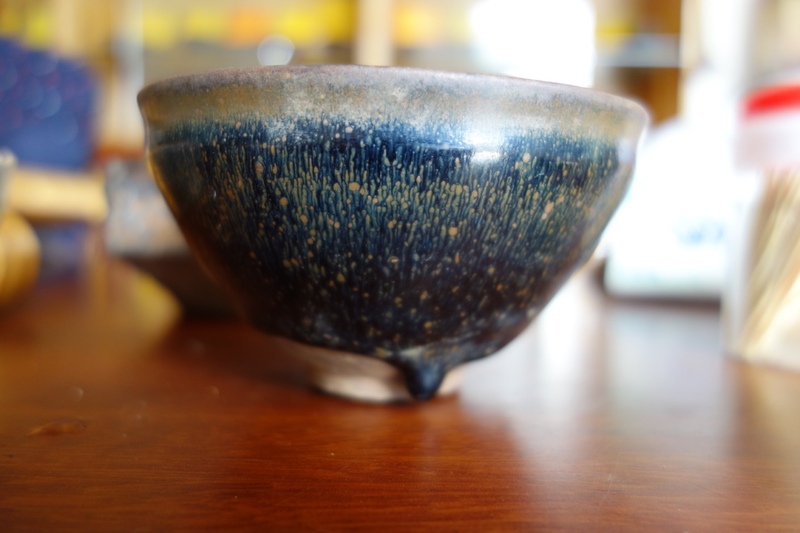 He begins his presentation by writing ‘USA’ on some scrap paper, then shows a general image of a collection, then some of the amazing bowls that he has seen there in close up. Our host is greatly impressed by the images and the information. He calls his wife and then her father, and then the neighbours and their children, all over to look and see. I look on with a wry smile, because what I see happening as I observe the scene from the outside, is a mis-understanding taking shape. What I think they are getting from all this is an understanding that Leo is American, he is the professor at a prestigious institution and that he has a personal private collection of amazing tenmokus! They are all very impressed. Exceedingly impressed! When he finally closes the laptop, the ‘Policeman’ suddenly turns and faces straight up to Leo, face to face, and then suddenly gives him a big bear-hug embrace! There is almost a tear in his eye as he tries to communicate that he is so impressed that he has finally met someone with a bigger collection of stolen antiques than himself. It’s a beautiful moment. Is this a mistaken case of honour amongst thieves? 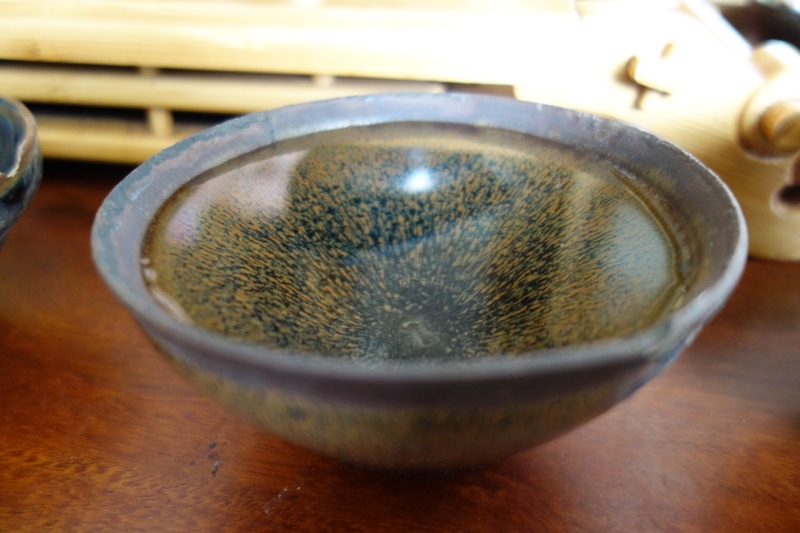 Suddenly, all the really good bowls that he has ‘found’ are brought out from the special cupboards and we are treated to a display of gorgeous bowls in almost intact shape. Wow! so many really nice objects and fragments of rare surfaces. Next, we are escorted out of the front ’sales’ room and out through the kitchen, outback, to the work area. here are numerous angle grinders and diamond cutting discs on the floor, tubs of water, with bowls and saggars sitting soaking in them. 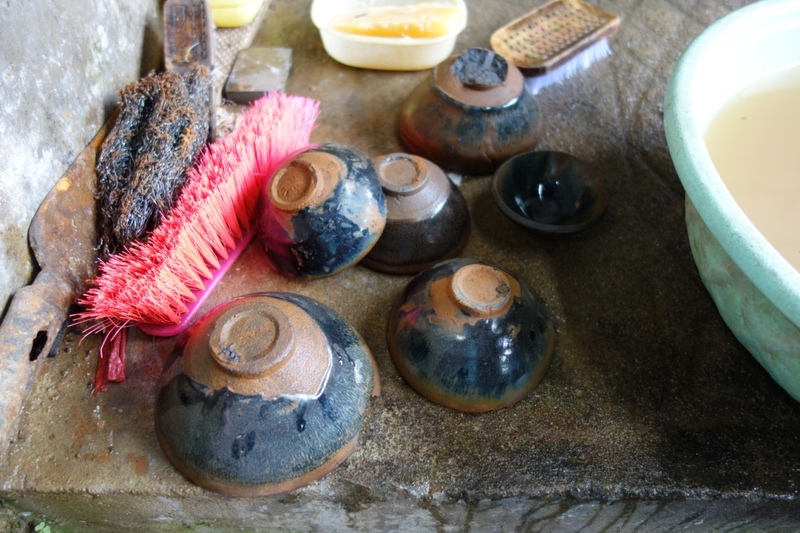 There are several works in progress going on, slowly, carefully, relieving the bowls from their glazed-in provenance in their saggars. 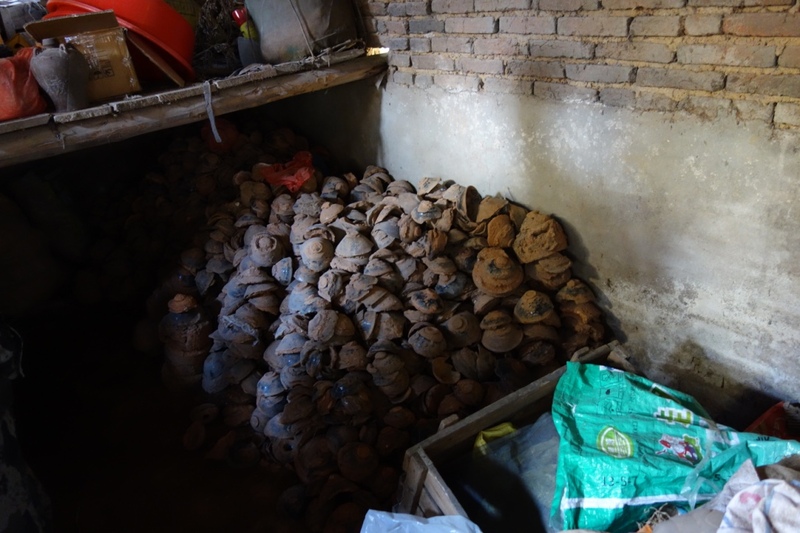 In a couple of ‘bunkers’ in the back room behind him, there are possibly another thousand bowls all stacked up haphazardly waiting their turn to be cleaned and polished ready for sale somewhere. I’m guessing that he probably would like us to buy one, but I already have several original tenmokus before I came on this trip, hence my interest. We are invited to stay lunch and we do. We are even offered home-made wine of some sort that stretches my definition of wine somewhat. I drink a small glassful. That’s more than enough for me, but he insists that I have a refill. I do, just to be polite, but it takes some effort to swallow. After that I have no hesitation in saying NO. I’ve had enough and honor is satisfied. 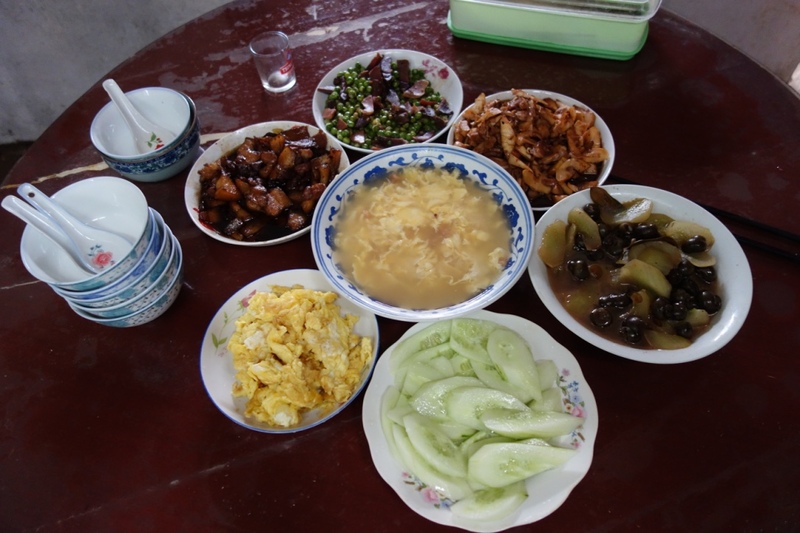 There are sauteed snails, scrambled egg, the usual entrails, bits of pork in black bean sauce and cucumber salad with salt and vinegar. 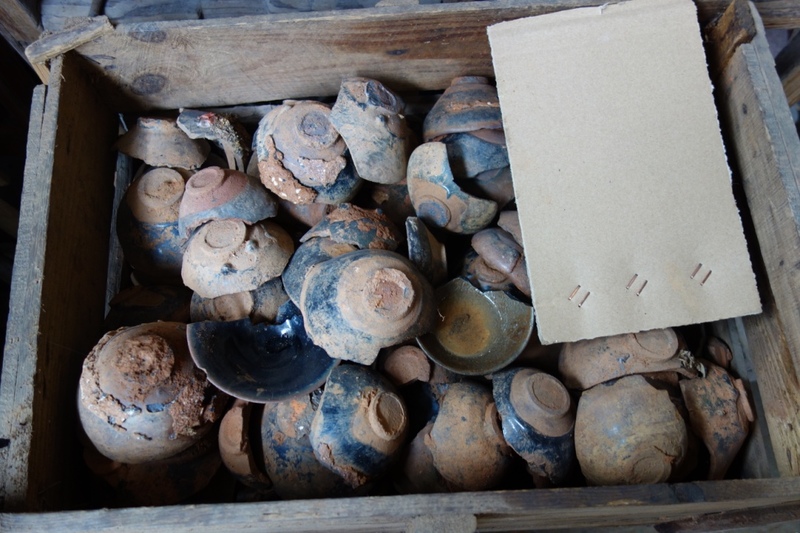 There are just so many nice pots here and even more in a state of partial restoration, plus lots of interesting shards and special pieces. 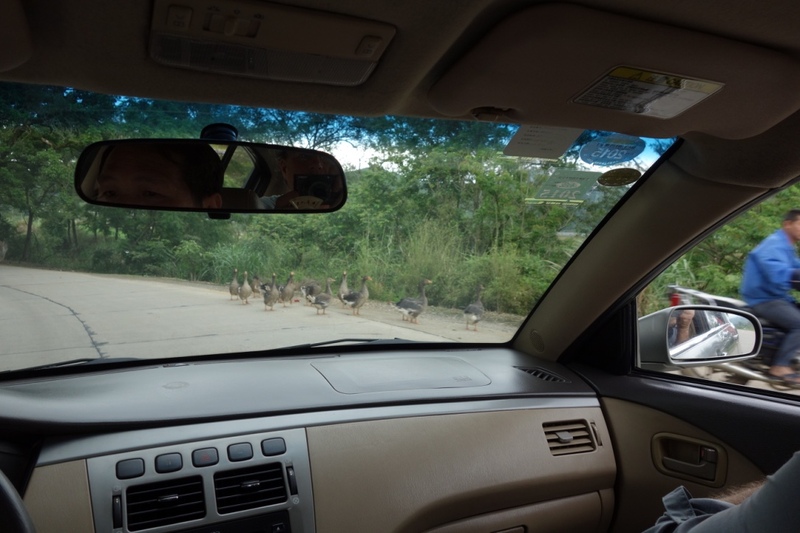 On the way back to the village we pass a gaggle of geese on the road. They are on their way home too! from Steve soon to be on his way home as well.